PULLMAN, Wash. – If a farmer’s goats, cattle or sheep are sick in Kenya, how’s the health of the farmer? Though researchers have long suspected a link between the health of farmers and their families in sub-Saharan Africa and the health of their livestock, a team of veterinary and economic scientists has quantified the relationship for the first time in a study. 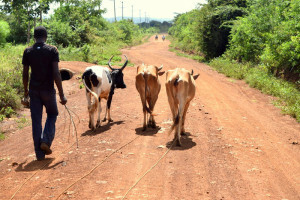 After tracking 1,500 households and their livestock in 10 western Kenyan villages for one year, researchers found a strong relationship between the number of illnesses among family members and the number of livestock sicknesses and deaths in the same household. Using hut-to-hut visits and free hotline numbers for farmers to call on mobile phones, researchers obtained data on 6,400 adults and children, along with more than 8,000 cattle, 2,400 goats, 1,300 sheep and 18,000 chickens. Analysis of that data revealed this: For every 10 cases of animal illness or death that occurred, the probability of human sickness in the same household shot up by 31 percent. “Our findings help to understand, in quantitative terms, the complex pathways that link livestock health to the health and welfare of the humans who own them,” said Kenya-based lead author Thumbi Mwangi, an infectious disease epidemiologist at Washington State University’s Paul G. Allen School for Global Animal Health. “It’s important because an estimated 300 million people living in sub-Saharan Africa depend on their livestock as a main source of livelihood and nutrition,” he said. – zoonotic, where healthy livestock are less likely to transmit zoonotic diseases—those that spill over from animals to humans, including food-borne infections. Livestock benefit families in multiple ways but the negative side of disease must also be considered, the authors argue. What’s not known is whether animals suffering from those ailments are passing the pathogens directly to the people who own them. It’s also possible that the environment where they live fosters propagation of those pathogens, the scientists write. In their next phase of study, they will try to pinpoint the underlying causes.